On Sunday 21st April Chiang Mai FC are at the seaside for the first of back to back away games (Trat follows a week later). Dale Farrington, Chonburi FC Supporter and Webmaster at “Screaming from Beneath the Waves” asked if I could complete a pre match Q&A. “Just a few questions” he said. Cough! So here goes: apologies in advance for any inaccuracies, and to those Chiang Mai FC supporters that know far more about the cub that I do! Robert Scott; age is just a number; born in the UK – left there in 1988 for Canada, then Hong Kong, Singapore, Thailand, the UAE and back to Thailand. Ex Reuters (though not a journalist); still do some consulting work – mainly financial, corporate, m&a. Q – How long have you been supporting Chiang Mai FC? We moved back from Dubai to Chiang Mai in late 2017 so 2018 was my first season watching Chiang Mai and our promotion run. Q – What first got you into supporting the club? It is a long way to go to watch Watford! I used to play reasonably seriously so finding a team that I could connect with has been a great part of living back In Thailand. It is also a fun way to explore the country. Why else would anyone go to Suphan Buri – and the folks there were very welcoming! Q – What have been the highlights of your time supporting the club so far? The away win at Lampang last season – in an overcrowded, makeshift stand that had been set aside for away fans and which would fail health and safety inspections anywhere else in the world. A crazy 6-5 win at Angthong – which was the Hiziel Soares show. The game of the season. Promotion after a nail-biting 2-2 draw at Khon Kaen. Q – And any low points? Last week’s loss to Chiang Rai was bad – for lots of reasons which had little to do with how the team actually played. Q – What are your thoughts on how you performed last season? I don’t think anyone really knew what to expect with a new coach and mostly a new squad. Promotion became a real possibility around mid-season. These were heady times. Chiang Mai had never played in the Thai first division. We even had the team parading around the moat to celebrate promotion. It was a team that worked really hard for eachother. And that made them fun to watch. Q – And what are your expectations for this year? Anything other than relegation would be a successful season. Sorry to sound pessimistic but that is the reality. Sadly the owners appear unconcerned by an immediate return to the Championship. Q – What are your thoughts on how you’ve started the season? Back to back wins at home to Ratchaburi (in appalling pollution – that game should have been postponed) and away at Suphan Buri showed that we can hold our own against some teams in this league. There are a couple of teams that look strong – Port and of course Buriram. It is hard to separate the remainder all of whom appear capable of beating eachother on their day. We lost to Chiang Rai last night but they looked a very average side. Q – How do you think the postponements have affected your start to the season? I don’t think there is a choice here. It is nonsense to be playing football or any other sport when the air quality is hazardous. The day after the Ratchaburi game K Thossapol (my favourite defender) posted a picture on social media after he had been awake all night with his young son in hospital. The boy had breathing problems because of the air. Forget football, tv rights etc. The health of players, officials and supporters has to be the priority. There have only been two postponements so far. And the postponed Chiang Rai game has already been played. I doubt there will be more postponements. But I think as soon as the AQI is forecast at 150 or worse then the league and the clubs need to be flexible. Switching fixtures makes sense to me. Q – What are your thoughts on the way your club is run? We were at SCG Muangthong a few weeks ago. It felt like professionals versus amateurs. Muangthong have everything from a real football stadium, to an academy, to vip and corporate hospitality, to an up to date website. It feels like a football club that is connected to it supporters and its sponsors. By comparison we are amateurs without any of the infrastructure on which the growth of the club can be built. We were poor country cousins on a day out in the big city. Buriram will no doubt be much the same on an even bigger scale. Just as an example the official CMFC website shows last season’s squad and fixtures. This is the sort of thing that is so easy to fix and requires little investment; just commitment. Q – What can you tell us about the recent resignation of the chairman and the affect it might have on the season? I don’t know enough of the details. And by kick-off he may even be back at the club. I think it will be tough for him to walk away from CMFC in its first year in the top division. What did happen is that two days before Friday’s home game against Chiang Rai FC, the away team, also owned by Boon Rawd, told Chiang Mai that most of their loan players at Chiang Mai (there are nine in total at last count) could not play in the game. Of course it makes little sense to have so many loan players from one club. The Thai FA allows this chaos by permitting one owner to own a number of clubs. The problem comes when one club is clearly seen as senior to the other. Effectively Chiang Rai (or the club owners) picked our team for us. The Chairman quit. How destabilizing this is I really do not know. It feels rather like a Thai soap opera. And I never understand those. Perhaps what is most frustrating about this is that the fans want, and are paying, to see the best players and want to see a competitive match. Q – Is there anything that the club doesn’t already do that you’d like to see introduced? An official web site that works, is current and is informative – in Thai and English and ideally given the number of tourists in Chiang Mai with fixture and access information in Chinese as well. This applies across all social media. Pre-match announcements of both teams starting line ups – in Thai and English – and posted on the score board. How hard can that be? A club store that is in one of Chiang Mai’s main malls rather than out in a distant moo baan. Removing all the tattered 2018 club banners that are around the city pronouncing “Great on Red” – last season’s rather strange tag line. This year’s tag line is the equally strange “Rise for the City” which makes us sound more like a bakery. Employ pr/marketing talent to help promote the club in every community in Chiang Mai. Invite Happy FM – our local English language radio station – to provide an English language match commentary. Build up an effective football academy and a scouting network that looks for talent across the North. In my ideal world we would also knock down the 700th anniversary stadium and build a modern football stadium. No running tracks. No jumping pits and fans a few yards rather than binocular distance from the pitch. At a very minimum invest in renovating the stadium which simply looks tired. Put seats in the three stands with concrete benches. Little things like repairing the perspex and removing the bird crap off the home dugout shelter would suggest that someone actually cares about first impressions! Q – How do you think the club will develop from here? It probably won’t. Not while it is part of the Boon Rawd group of clubs. There is no new investment. There is an over –reliance on loan players. The best hope for the club is a change of ownership with new ideas and real investment. However, I do not see a queue forming. Q – How important is it for cities and clubs the size of CMFC to be involved in the TPL to help its development? 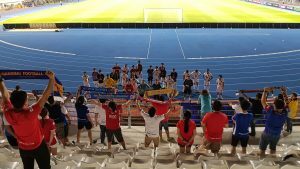 The rise of JL Chiang Mai United – and a number of other clubs around the city suggest that there is plenty of enthusiasm for the sport in the city. There is also plenty of precedence for smaller cities (basically anyone outside of Bangkok) in Thailand to produce very competitive football clubs – Buriram, Chiang Rai and Chainat are good examples. Q – If you could give your owner/chairman one piece of advice, what would it be? Embrace and connect with your supporters. Social media that talks to the fans and is timely and informative. Better transport connections on match days – run buses from the city’s main malls to the stadium. Chiang Mai is a tourist town; make watching a match a part of that holiday experience. The Chinese, for instance, love their football. But have probably no idea when CMFC has a home match. Make them welcome. Q – What are your thoughts on your coach? I like Carlos Parreira a lot. Genuinely decent guy. Has time for the fans. Respectful but committed. And is making what he can out of limited resources. I was happy he stayed on for the 2019 season. I doubt he will be here next year. He will be at a bigger club. Q – And your squad? Sound. Committed. Fit. A bit short on pace. But plenty of heart. I have no idea why Soares is out on loan at JL Chiang Mai. For many of us he was our player of the season in 2018. Real pace. A goal scorer. And gave 100% plus every game. David Bala was brought in as a replacement and has already left and is not missed. Solid at the back. Usually a back three of Evson, Thossapol and Suwannaphat. Expect five across the middle – including the veteran Pichitphong (his fitness is remarkable), the young U-23 international Ekanit (who I don’t think has quite found his form this season) and Gionata. Chotipat and Surawich are the likely wing backs. There are not enough goals or goal attempts coming from midfield. Leaving Eviason and Azadozoy up front. Both scored at Suphan Buri. Q – If you could give your coach one piece of advice, what would it be? Bring back Soares. Play three up front with Eviason as the central striker; Soares playing off him as a number 10; and Azadzoy free to go to either wing. Q – What do you know about Chonburi FC? You are by the sea – after two months of Chiang Mai pollution that makes me happy. This is a strange league – you lost badly at Suphan Buri and then go and win at Bangkok United. Lukian is clearly the man to stop and that should be a good all Brazilian scrap with Evson. You are leaking goals at 2 a game this season – worse than any team in the league. Your crowds are lower than I expected – though no doubt away supporters will as usual be relegated to some distant corner of the stadium. Q – What are you expecting from the match on the 21st? It does look like there will be goals. I would take a point. Q – Would you care to make a score prediction? 2-2. Because I want that point and there should be goals. Q – Which of your players do we need to keep an eye out for and why? Azadzoy. Back from a long injury and starting to find last season’s form. And for his sheer love of playing – Thossapol. Eviason’s direct runs are fun to watch – but they are a little too rare. Q – Which of our players are you most wary of and why? See above; Lukian looks like the man to stop. Q – How many fans do you think you will bring? Q – Is there anything else you’d like to add? Thanks for asking me. I fear I have done a disservice to others who know far more about Chiang Mai FC than I do, or ever will. I hope they forgive me!